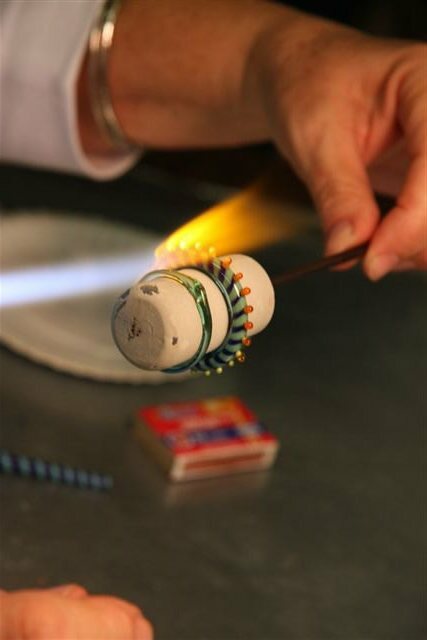 Watch Heather Trimlett demonstrate how to make a Big Hole bead during her class at The Studio in Corning NY in 2013. Building up a paddle of cobalt glass. White glass will be added. 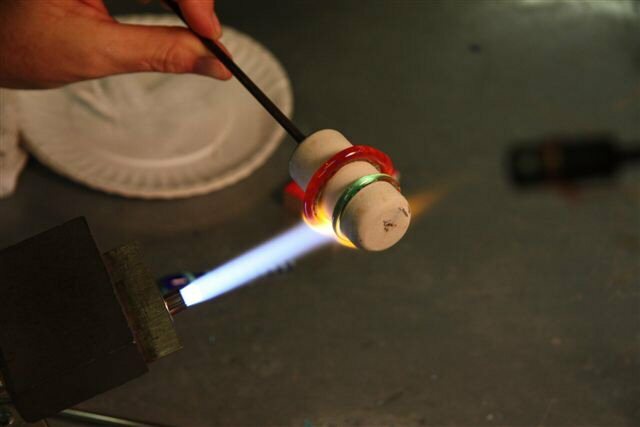 A metal punty is applied to each end and the glass is heated as Heather prepares to pull and twist. The twisted stringer is finished and cooling. Heather starts the disk bead using a base of transparent aqua glass. The black and white stringer is applied to the base bead. The bead is heated to keep it centered, even, and straight up. Heather lets the disk cool so that we can see how evenly the stringer is applied. Try to find where the join is - not easy when it is a Heather Trimlett bead. The disk is warmed up again ready for the next step. Heather applies tiny dots. Look how evenly spaced and sized they are. The bead is warmed again. Heather adds some more glass to each dot. Almost done. Transparent dots still need to be added to all the bumps. Heather demonstrates how she makes twisted stringer and disk beads. Heather demonstrates how to make a fancy ribbon cane. You'll see how she plans and creates a beautiful twisted cane created with Italian soft glass rods, and encased with hand-pulled Lauscha clear.